It’s May and the weather keeps going from hot to cold, so this past weekend I found myself wanting to make a mix of clams and mussels! I love them, but I used to only eat them when dining out because I could never get them cleaned. I learned a few tips that make them so easy to prepare and my guests just go crazy. For mussels, scrub them with a brush under cold water and scrape off any barnacles with a knife. If the beard is still attached (most cultivated mussels have been trimmed mechanically), remove it by pulling it from tip to hinge or pulling and cutting it off with your knife. Do this just before cooking. Discard any with cracked or open shells. I also have a great tip for getting the sand out of clams. Rinse them off in cold water to get rid of the gunk. While keeping them submerged in water place a stainless steel spoon over them and stream water continuously for ten minutes. The combination of the water and the stainless creates an electrical current that causes the clams to spit out any sand. And what about the grand debate between New England and Manhattan clam chowder? In the San Francisco Bay Area where I grew up you find both done very well, but don’t tell them in Boston! Grab some crusty bread, a nice glass of wine and enjoy these recipes sure to bring on stimulating conversation and a spectacular evening. Render the bacon fat. Slowly cook the bacon with the olive oil until the bacon is crispy. Remove, chop and set aside. Turn the heat to medium-high and sauté the carrots, celery and onion until soft and translucent, about 4-5 minutes. Do not brown the vegetables. Return chopped bacon to the pot. Add the garlic and cook for another minute. Add the herbs, tomato juice, clam broth and the juice from the canned clams, mix well, then add the potatoes. Bring to a simmer, cover and simmer gently until the potatoes are done, about 30-40 minutes. When the potatoes are tender, add the canned clams and the live clams cover the pot and simmer until the live clams open up, about 5-10 minutes. Add tabasco, salt and black pepper to taste. Place a clam in shell or two in each bowl for serving. In a large soup pot bring clams, clam juice onion, celery and potatoes to a boil. Reduce to medium heat and simmer until vegetables are tender. In the meantime, melt butter; add flour, blend and cook one minute or two. Add half & half. Cook and stir until smooth and thick. After you have made the white sauce and it is the thickness you want, just turn the stove off and wait for about 10-15 minutes before you add the un-drained vegetables and clams. Season with salt and pepper to taste. Serve with oyster crackers! In a large soup pot, heat butter on medium heat. Cook the shallot and celery without browning for 1 to 2 minutes, then add the garlic with thyme and bay leaf, and continue to cook for 1 minute. Add the mussels and white wine, with a bunch of parsley. Season with salt and pepper and cook on high heat, covered until all the mussels are open about 5 minutes. Discard all mussels that are not open. Remove the mussels from the pot and set aside. Filter the juice. Shell the mussels (keep 1/3 with the shells). In the stockpot, pour the juice again and add the coconut milk, saffron and turmeric and heat to reach a simmer. Add the mussels and keep warm. Serve with fresh parsley in bowls, and accompany with a tasty loaf of rustic bread! Melt butter and add garlic. Stir and keep warm over low heat. Wash clams thoroughly in running water. Arrange clams on baking sheet and bake at 450° F. for 15 minutes till they open. 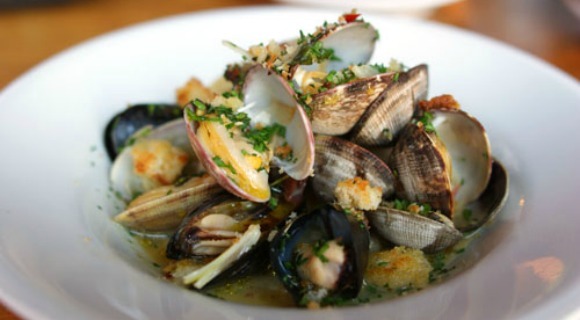 Serve the clams warm with the garlic butter. In a large, heavy saucepan, heat the olive oil over medium heat. Add the shallots, ginger, and chili pepper. Cover and cook over low heat, stirring frequently, until the shallots are soft (about 7 minutes). Add the curry powder and cook, stirring, for 30 seconds. Increase the heat to high, add the clam juice and lime zest, and bring to a boil. Boil until reduced to 2 cups, about 5 minutes. Add the mussels, cover, and cook, shaking the pan frequently, until all the shells have opened, 5 to 7 minutes. Scoop the mussels into large bowls. Stir the coconut milk and sugar into the broth and adjust the seasoning. Add cilantro. Spoon the broth over the shellfish and garnish with fresh lime wedges. Serve immediately. In a small saucepan sauté chopped garlic and fresh parsley with melted butter. Keep warm on low. Place clams in the bottom of a clam steamer or deep boiling pot. Add beer. Beer level should be only 1-2 inches from bottom. Cover and bring beer to a boil and steam until top clams barely open (about 3-5 minutes). Do not over cook, as clams will become tough and rubbery. Clean the mussels, scrubbing to remove the beards. Clean the clams as described above. In a sauté pan, heat the olive oil. Add the chopped garlic and shallots. Sauté until they soften. Add the white wine and lemon juice. Finish with the parsley and chives. Add the mussels and clams. Cover the pan and let mussels and clams steam open. Place tomato juice in a pot and bring to a simmer. Add onion, celery, rosemary, marjoram, oregano, garlic, and fish to the pot and simmer, covered, for an hour to thicken broth. Add the wine, shrimp, and clams and heat to a boil. Reduce to a simmer and cook until the shrimp just turn pink. Serve in heated bowls, topped with cheese, a wedge of lemon, and parsley.